It's really easy to tell you why you should choose a CleaRinse system for your boat, RV or vehicle washing needs. All of our products are heavy-duty, high quality systems that are built to last and all of our products do their job... spotlessly! CleaRinse water filtration products have become a favorite of serious boaters and RV'ers. They're featured on many boating and RV websites. The reason? CleaRinse has built a reputation based on the design and manufacture of premium quality water filtration products. With CleaRinse you receive consistent performance, lasting quality and prompt, professional service. If you need a spotless wash then CleaRInse is your choice. Our filtration systems have earned the reputation as products that work extremely well and deliver a clean spotless finish as promised. CleaRinse Portable Wash Down Systems (PWS) provide boaters and RV'ers with softened filtered water anywhere, anytime. 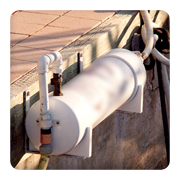 Our systems are designed to withstand the harsh marine environment, providing years of trouble-free service with minimal maintenance. Constructed of CNC machined Starboard® Marine Grade Polymer, Machined Schedule 40 BDA aluminum pipe, stainless steel fasteners and brass fittings, the durable stand makes CleaRinse PWS easy to transport while minimizing dock clutter. All CleaRinse PWS operate in the correct upright position and utilize proven technology to soften and filter your incoming water supply. No gimmicks or unsubstantiated hype just pure performance. For custom and mega-yachts of any size, we offer Custom Inline Systems designed to meet your specific needs and consumption. With over 9 years of experience in the marine industry we can provide systems to meet the most demanding requirements regardless of the application. For marine applications we offer single and dual tank systems with resin beds designed to best meet your cleaning and maintenance needs. Just give us a call (561 596 2085) and we can discuss your specific vessel size, usage and requirements and we will design a custom system for you. For commercial or high water consumption applications, we offer Reverse Osmosis (RO) Systems ranging from 50 to 1200 gallons per day. If you're a mobile detailer, fleet washer or window washer one of our RO systems will provide you with high volumes of pure, "Spot Free" water. For onboard and personal consumption we also offer a variety of under counter RO Systems. Reverse osmosis is an alternative method to de-ionization, and also removes the vast majority of minerals and impurities that cause spotting on vehicles and boats. Reverse osmosis uses pressure to push water through semi-permeable membrane against the direction in which it wants to flow, leaving behind the minerals and contaminants. The success of reverse osmosis is critically dependent on the specific membrane and filters used. CleaRinse systems only use the highest quality membranes and filters to ensure maximum water quality. Unlike conventional filtration, which can only remove larger particles, reverse osmosis can remove particles as small as 0.001 microns, which is 100,000 times smaller than the width of a human hair, ensuring that up to 99% of the harmful minerals are removed. If you want the highest quality system available on the market today, producing some of the purest water possible, you need a CleaRinse Reverse Osmosis System.